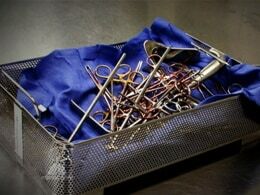 There is no certification required for people who sterilize surgical instruments, and improper cleaning practices are becoming a growing problem. NBC’s Dr. Nancy Snyderman reports. >>> as we said our health news tonight comes right out of the operating room . nbc news partnered with the center for public integrity to look at what some have called a growing problem in this country, dirty surgical instruments sometimes making their way into surgeons' hands and thus, patients' bodies. nancy snyderman has more. >> reporter: like most patients john hairson put his faith and trust in the surgeon standing over him in the operating room . >> i had to have surgery to repair my shoulder. i was not worried one bit. >> reporter: two weeks after rotator cuff surgery, john was back in the hospital with a life-threatening infection. the cause? a dirty surgical instrument . and a new report says surgical tools contaminated with hidden blood, tissue or other debris are showing up with alarming regularity. >> it is a job that cannot be given to robots because the robot doesn't have the critical thinking to say this is still dirty. >> reporter: at the hospital in virginia which is not the hospital where john was treated, sharon greengolden has made her sterile processing department a model for what should be happening across the country. because in every state, except new jersey, there are no requirements that workers who sterilize instruments have any kind of training or certification. >> barbara has a license. the dog groomer has a license. the tattoo artist has a license. and i'm dealing with instruments going into your body and i'm not required to be certified. >> reporter: the health system ran a tiny video camera through 350 suction instruments that had been sterilized and deemed ready for the o.r. all contained some kind of debris. it's not each an old instrument. oh, my gosh. now you shocked me. that's pretty horrifying. if a dirty medical device finds its way into the operating room the fda does not require hospitals to report it. the fda says hospitals are reminded to carefully clean and sterilize reusable medical devices . a patient's risk of acquiring an infection from a reprocessed medical device is very low. for john, what was supposed to be a six-week recovery has turned into a three-year nightmare. >> it changed my life and changed every aspect of it. thous of days of waking up in pain. >> reporter: last summer the fda held a work shop for instrument makers and hospitals where the fda and cdc talked about the challenges with cleaning complex instruments. now the same group will have to find a solution to keep up with this problem so surgeons and patients can enter the operating room knowing that the instruments they have to rely on are clean and safe, brian, it will be a monumental task. >> that will get your attention. nancy, thank you, as always.